This FAQ aims at amateur photographers and woodworkers who are considering building a large format camera. The first version was published in August 1996. Last updated October 2018.
woodworking skills will go a long way. Patience and accuracy are vitues that will be reflected in the final object. try-square), straight tip and cross-head screwdrivers, metal files, wood files, clamps (miter or corner clamps are useful but not required), a smoothing plane, a knife, chisels, callipers, a metal ruler, sandpaper of assorted grades. For some designs a soldering iron may be needed. bottom) and base and on-axis tilt of the front. Monorail cameras often have on-axis tilt (the rear frame tilts on the optical axis). Most flatbed cameras fold up into a box; monorail camera do not. Monorail cameras are easier to build, partly because the camera is not designed to fold up. Monorail cameras may have friction focusing or geared focusing. Collapsable flatbed cameras need rack and pinion focusing. They usually require more metal work than a monorail camera. Flatbed cameras are often referred to as field cameras, though many monorail cameras may be used in the field as well. How much do the materials cost? The answer depends on your design and your choice of materials. Hardwoods suitable for cameras are cherry, mahogany, teak, walnut, oak,and ash. All wood has to be well seasoned so that it does not warp. Many commercial cameras are made of cherry. Expenses also depend on whether you make a bellows yourself or buy the bellows. In general the materials of a view camera are not very expensive. How long does it take to build a camera? Your first camera takes more time than your second. The first time you build a camera you will spend considerable time pondering over details and looking for suitable hardwoods or metal parts. This is part of the pleasure of building your own camera. Building a camera may take 50–100 hours. What points should I pay special attention to when deciding on a design? Camera movements: When choosing a design you should think of how much camera movements you want (tilt, swing, shift, rise and fall). Camera movements distinguish large format cameras from rigid-bodied cameras and make possible control of perspective and depth of field. You may have to choose between on-axis tilt (the frames tilt on the optical axis) and base tilt (the frames tilt on an axis near the bottom). Read about camera movements before you decide on a design. Accurate and comfortable focusing: Focusing must be accurate and easy to operate. Friction focusing, i.e. gently pushing or pulling the sliders which carry the front and rear frames, works well with monorail cameras. Flatbed cameras normally need rack and pinion focusing (gears). Easy changing from the horizontal to the vertical format: The back should have a lock which makes changing from horizontal to vertical format easy. Sturdiness: The optical bench of the monorail camera or the struts of the flatbed camera should be sturdy. 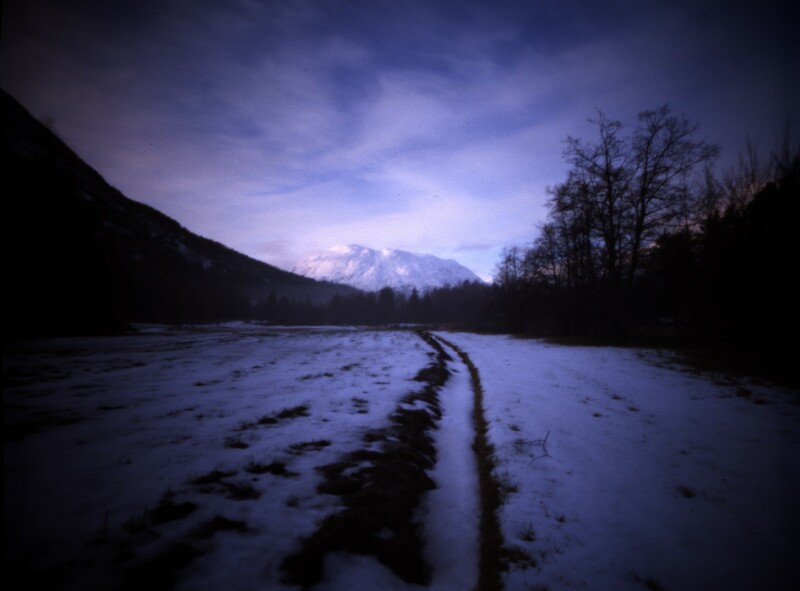 Inserting a film holder should not change your focusing. Tilt axis: During the construction you should also pay particular attention to accurate positioning of the tilt axis of the front and rear frames. The tilt axis of the front and rear frames should be level to ensure accurate camera movements. Can I make my own ground glass? 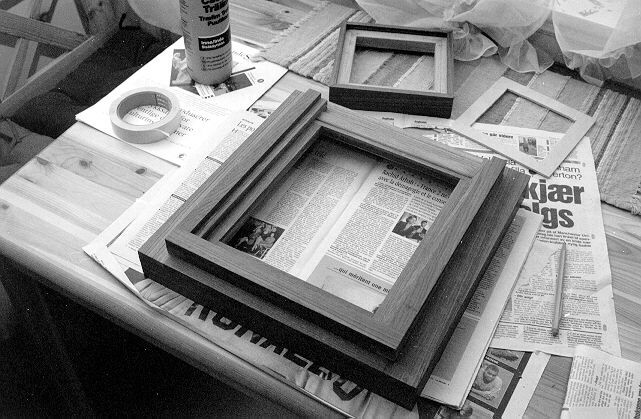 Commercial ground glass for 4 x 5 cameras is fairly inexpensive. For larger formats it is pretty expensive. However, for any format you canmake excellent ground glass yourself at hardly any cost. Get some # 600 carborundum or # 500 corundum. Put a piece of glass on a flat surface. Mix about a teaspoonful of carborundum/corundum with water to make a paste. Put the 2 mm piece of glass which is going to be your ground glass on top and move it in small circles as you exert some pressure. 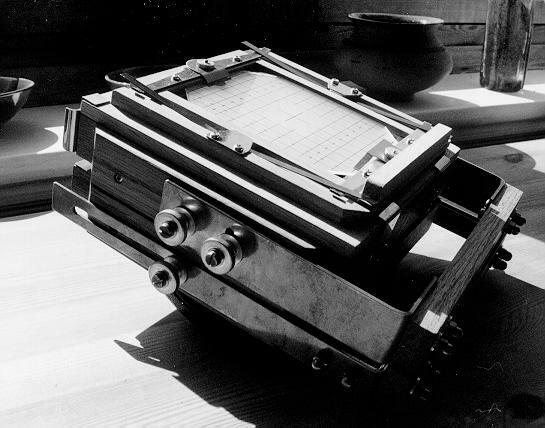 Grinding a 4 x 5 ground glass may take 5–10 minutes. An 8 x 10 ground glass may take 20–30 minutes depending on your experience. Where do I find plans or instructions? Robinson, Mike. “How to build a camera bellows”. View Camera, July-August 1996, pp. 52-55. Sacramento, CA. Romney, Edward H. Bellows making text. 14 pages. Drayton, SC. 1990. Romney, Ed and James Tannehill. Build a view camera. 23 pages. ISBN 1-886996-63-6. (Plans for a 2 x 3 metal view camera, expandable to 4 x 5.) Drayton, SC. 1979. What sites are there on the net? Where do I find a forum for cameramakers on the net? Where do I find thumb nuts/screws, gears or other metal parts for my camera? Where do I find a reasonable lens for my camera? Where do I find data about large format lenses? Where can I have a barrel lens mounted in a shutter? Where can I have bellows made for my camera? What good sources are there for the history of view camera design?